In an article by the staff at Mayo Clinic, oral health is described as, ‘the window to your overall health.’ As humans, our mouth, teeth, and gums are full of bacteria. While most of this bacteria is harmless, it can become harmful to both the oral region and other areas of the body if not cleaned and looked after properly. Why should you convince patients to care about their oral health? 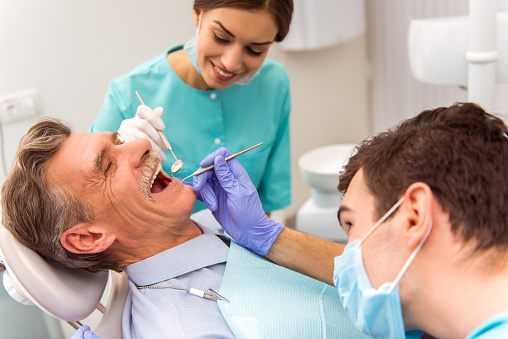 From a business perspective, patients who care about their oral health can be more likely to schedule routine checkups and accept their treatment plans. From a customer service perspective, by educating your patients about the importance of oral health, you can help them make healthier decisions about their mouth. Various research studies have shown a person’s oral health is connected to their overall medical health. What this means is if a person does not take care of their mouth, teeth, and gums, they have a higher chance of contracting diseases or having declining health in other areas of their body. In the case one of your patients does not know about this connection between their oral health and their overall medical health, it’s worth letting them know. For some patients, have something concrete to read or look can make a point stick more than if you had only told them verbally. By creating a pamphlet or short video about oral health, your patients will now have something they can take home and spend quality time looking at or discussing with their friends and family. Many dentists recommend electric toothbrushes to their patients because they are more effective at removing plaque, are easier to use for people with limited mobility, and sometimes have built-in timers. By informing patients about electric toothbrushes and their various benefits, you may inspire them to care more about their oral health. If the majority of your patients aren’t coming in for routine checkups, you’re missing out on valuable opportunities to educate them about their oral health. This is because every point of contact with patients is so important. People lead busy lives, and their oral health may not be their top concern – or even in their mental list of top 100 concerns. To help bring more attention to oral health, reach out to patients who aren’t coming in for routine checkups. If they are still hesitant to come into the office, try sharing facts or statistics about the connection between oral health and overall medical health. For most people, consuming a small amount of added sugar each day is perfectly fine. As humans, we need sugar in the form of glucose to fuel our cells and keep our brains functioning. The problem is most people are eating way more than the recommended daily amount of added sugar. This can cause various oral health concerns, two of which are an increase in cavities and gum disease. In a study completed by the United States Department of Agriculture, the average American consumes an average of 66 pounds of sugar per year. That translates into about 82 grams of sugar per day – much higher than the American Heart Association’s recommended daily added sugar intake of 25 grams for women and 38 grams for men. These numbers point out why some dentists call sugar a ‘poison.’ Dr. Alvin Danenberg, a dentist and contributing writer for DrBicuspid.com, always makes sure to talk about the dangers of sugar with his patients. While many patients know they shouldn’t eat too much sugar, they often forget the specifics or see the impact of sugar on their own teeth.